Play video Is the UK in a crisis? from BBCIs the UK in a crisis? SNP MP Stephen Gethins says there is "chaos and confusion at the heart of government but also at the heart of the Labour Party". "When you have a government that is so utterly divided and a Labour Party that continues to sit on its hands, it is a sorry, sad state of affairs," he adds. He says the prime minister should have engaged with other parties rather than just the DUP and what he describes as "the headbanger wing" of the Conservative Party. The scenes inside - and outside Parliament - as MPs vote to extend Article 50 and delay Brexit beyond 29 March. With the conclusion of the votes on the government's motion to seek an extension of Article 50, the Commons has moved on to other things. Conservative MP Justine Greening is introducing her adjournment debate on the housing provider A2Dominion. Health Secretary Matt Hancock said the idea of another referendum was "emphatically rejected". He said MPs had increasingly made clear what they did not want and added that they now had to chose between a no-deal Brexit and the prime minister's deal. He also denied that there had been a row at this morning's cabinet over the issue. "If anything it was cathartic," he said. The EU Commission says it will "take note" of tonight's votes but that a request for an extension of Article 50 will require the unanimous agreement of all 27 member states. "It will be for the European Council to consider such a request, giving priority to the need to ensure the functioning of the EU institutions and taking into account the reasons for and duration of a possible extension," they said. The SNP's Westminster Leader Ian Blackford says the UK was in a "crisis" - just two weeks away from potentially "crashing out" of the EU. Raising a point of order he asks how the Commons can get back the Trade Bill from the Lords, where it has suffered a few defeats and has now changed, before Brexit happens. He also accuses the Labour Party of "utter hypocrisy" over another referendum. Commons Speaker Mr Bercow says that the Trade Bill will come back when the Lords are finished considering it. Is the Brexit tide turning? Labour Leader Jeremy Corbyn says the prime minister should accept that her deal and no deal are "no longer viable options". He urges Theresa May to bring forward the necessary legislation to amend the date of Brexit. He says Labour has a plan for the UK to leave the EU but also reiterates his support for a public vote on the issue, "not as political point-scoring but as a realistic option to break the deadlock". Labour abstained on a vote earlier calling for another referendum - arguing that now was not the right time for a fresh vote. What does the vote to delay Brexit mean? MPs have voted in favour of the government's motion to extend Article 50 and delay Brexit beyond 29 March. The government will now seek permission from the EU to delay Brexit beyond this point. The motion states that Article 50 will be extended until 30 June, if MPs approve the prime minister's deal by 20 March. If an agreement on a deal is not reached by the 20 March, the government will seek a more substantial extension, but the EU would have to agree to this and set the terms. 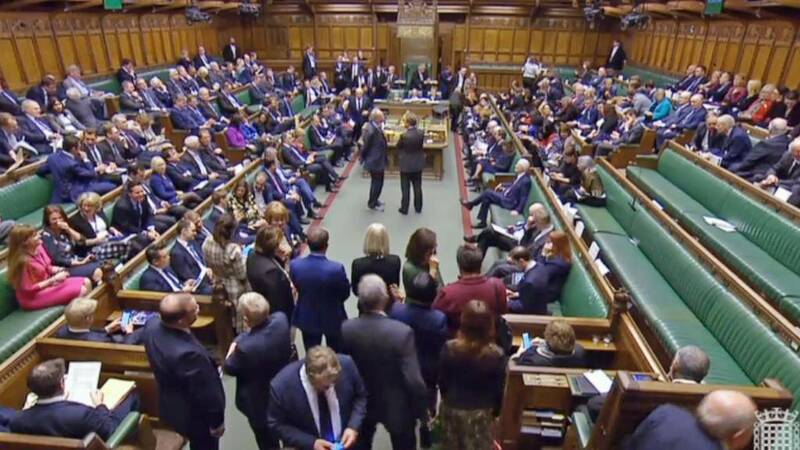 MPs have backed the government's motion to seek to extend Article 50 and delay Brexit beyond 29 March by 412 votes to 202 - a majority of 210. Sam Coates of The Times tells the BBC that the government still has an "enormous" amount of work to overturn 75 Conservative votes on the withdrawal agreement. But, he adds, the government is still in control for now. Katy Balls of The Spectator says that the EU may propose an "unfavourable" long extension, which may well trigger some MPs to voting for the deal. Mr Coates adds that what is happening now is a "consequence" of decisions made at the beginning of Mrs May's premiership, when she refused to work across party lines on Brexit.